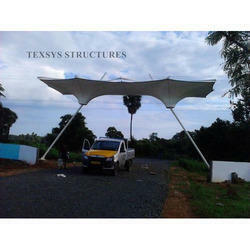 We are the leading manufacturer, wholesaler and exporter of Entrance Canopy to our valuable clients. With the help of our state-of-the-art infrastructure unit, we are able to supply the superlative quality of Entrance Canopy. Used at the entrances to public buildings or buildings that are available and are commonly used by members of the public, offered canopy is manufactured by our adroit professionals using superior quality raw material and ultra-modern technology in compliance with industry standards. This canopy is available in modern design, appealing patterns, and vibrant colors. 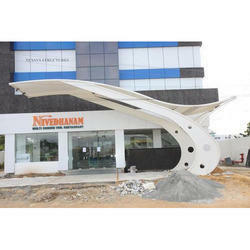 We hold expertise in providing an extensive range of Funnel Shaped Entrance Canopy. This entrance canopy is highly acclaimed for its properties like durability, low maintenance, and long life. Serves the purpose of providing temporary shelter from inclement weather for those who are entering or leaving the building, this entrance canopy is manufactured by our skilled professionals using excellent quality metal and advanced technology. We can manage any aspect of the project, from initial tender to installation each member of the team is highly qualified and has managed tensile faWe hold expertise in providing an extensive range of Funnel Type Entrance Canopy. 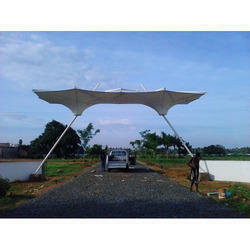 This entrance canopy is highly acclaimed for its properties like durability, low maintenance, and long life. Serves the purpose of providing temporary shelter from inclement weather for those who are entering or leaving the building, this entrance canopy is manufactured by our skilled professionals using excellent quality metal and advanced technology. 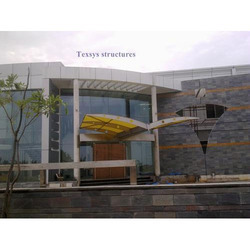 Owing to the dedication of our diligent professionals, we have earned a reputed name in supplying the finest quality assortment of Designer Entrance Canopy. Our offered canopy is widely used at places like public libraries, hospitals, hotels, bars, local authority offices and large department stores. Apart from this, provided canopy is manufactured by our adroit professionals using premium quality raw material and sophisticated tools.